Within the program for a teaching degree in Economics for Gymnasium students gain fundamental knowledge of Economics, including economic methods. The program prepares students for positions as teacher by conveying qualifications in the subject and in didactics. By combining the main fundamentals of Economics, Business Administration and Law, together with a second subject, students are qualified for teaching at Bavarian Gymnasien (the type secondary schools in Germany preparing directly for universities). You can combine Economics with all subjects as listed in the examination order for the first state examination for teachers (“LPO I”) if the respective subject is offered at the Friedrich-Alexander-University. In details, those subjects are English, Geography, Informatics and Mathematics. To pass the basic principles examination (“Grundlagen- und Orientierungsprüfung”), students must complete modules adding up to 20 ECTS credits within the program in Economics. You can get a Bachelor and a Master Degree with your Teaching Degree for Gymnasium. To get a Bachelor Degree (in combination with Economics, a Bachelor of Arts) you must pass 170 ECTS credits from modules scheduled for the first six semester of the curriculum (including both subjects, pedagogics and didactics). The remaining 10 ECTS credits are obtained for your bachelor thesis. Your thesis for the state examinations might be accepted as bachelor thesis on request. You must request the bachelor degree latest one year after you passed the first state examination. For a Master Degree you need to enroll for the Master program for Teaching at a Gymnasium. You need to apply for this program. For your application, you must have requested your Bachelor degree; the overall average grade of your Bachelor degree must be 2.5 or better. If your average grade is between 2.5 and 3.0, there will be an interview. If you enrolled, the master program is identical with the curriculum of the 7th to 9th semester of the program for your teaching degree. In addition, you have to submit a master thesis (30 ECTS credits). You may find further information about the Bachelor and Master degree on the Homepage for the teaching degree for Gymnasium of the Center for Formation of Teachers. 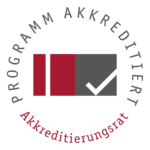 The bachelor as well as the master program is accredited within the system accreditation of the Friedrich-Alexander-University Erlangen-Nuremberg. This means that requirements for legal framework and quality control are fulfilled.